ABOVE: Schloss Nymphenburg became the summer palace of Bavaria's electors, kings, and dukes in 1675. Munich (in German, München) was born 850 years ago, when Henry the Lion--the Duke of Bavaria and Saxony--was on a development binge that led to the creation of Munich, Lübeck, Brunswick, and several other cities. In 1504, Munich become the capital of Bavaria; and by the mid-19th Century, it was a major city with an archbishop, a university, an opera house, palaces, and the other trappings that might be expected of a kingdom's royal seat. Munich gained notoriety in the 20th Century as the birthplace of the Nazi party, which regarded the city as the "capital of the movement" from 1920 (when the party was founded in the Sterneckerbräu beer hall) until the collapse of the Third Reich. The party's "spiritual center" was the Feldherrnhalle (inset photo), a Bavarian war memorial that dates to the 19th Century but is now associated--not altogether fairly--with the Hitlerzeit. For more historical background, see Wikipedia: Munich. Modern Munich is a city of 1.35 million inhabitants in a metropolitan area with a population of six million. 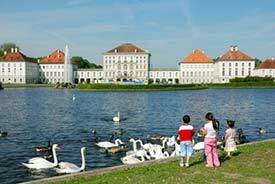 It's one of Germany's most properous cities, and as the capital of Bavaria (which has long been popular with American and British tourists), it attracts more English-speaking visitors than any other German city. Top photo copyright © Manfred Steinbach. 2nd inset photo copyright © Peter Jobst.